Have you used Engineering Everywhere (EE), EiE’s out-of-school-time program for youth in grades 6–8? This free-to-download curriculum empowers youth to become engineers and solve problems that are personally meaningful and globally relevant. EE units engage the youth in your OST program with context-setting videos, articles about real-world technologies, and exciting design challenges. 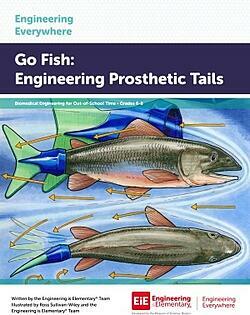 If you’re curious, why not dip your toes into the water with Go Fish: Engineering Prosthetic Tails? It’s an EE unit that challenges youth to become biomechanical engineers as they design prosthetic devices that help animals in need. Each EE unit begins with a 10-15 minute context-setting Special Report video. In this video, our Engineering and Technology Correspondent Daniella explains how engineers use the Engineering Design Process to design prosthetic devices for animals with missing or injured limbs. Youth learn about internet celebrity Derby the Dog, a husky born with underdeveloped front legs, and the engineers at 3D Systems. They’re using an iterative design process to develop and improve prosthetic legs to help Derby walk and run. This video introduces youth to the criteria they need to keep in mind when designing their own prosthetic devices, and it’s guaranteed to get them excited about engineering! Engineering Everywhere units are designed for the unique environment of OST programs. Youth can have fun engaging in smaller design challenges without needing to attend each individual lesson. 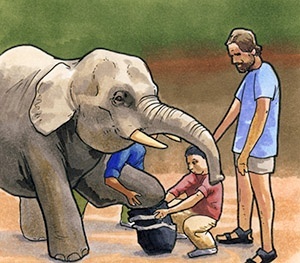 Throughout this unit, youth will read articles about real animals who received specially engineered prosthetic limbs, such as Beauty the eagle, Chhouk the elephant, and Winter the dolphin (youth might be familiar with her story from the movie A Dolphin’s Tale). Then, they are tasked with designing and testing an elephant leg for function, comfort, attachment, and durability, and creating an eagle beak with a very specific and delicate function—to simulate an eagle’s eating and preening needs, their prosthetic must be able to braid a set of strings and pick up small objects.. 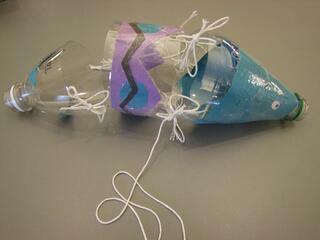 In the unit’s culminating challenge, youth will tackle a new challenge: designing a prosthetic tail for a fish! Using a plastic bottle and string, youth will design a model fish and decide on characteristics like species name, color, habitat, and diet. Using what they learned from previous challenges, they’ll test their prosthetic tails for function, comfort, attachment, and durability. And when they’re finished improving (and decorating!) their designs, they’ll get a chance to flex their communication skills by developing an exhibit to showcase their model fish and their prosthetic tails! The Engineering Showcase is the last activity in each EE unit. It gives youth the chance to show off their accomplishments to friends, family, and other youth in the program—and it’s a lot of fun! Engineering Everywhere units use a lot of materials, and the quickest and easiest way to get started is to buy a materials kit containing everything you need for a group of 24 youth from our online store. You can also always source the materials yourself—Go Fish is particularly easy to source in your local craft or department store, utilizing items like foam, construction paper, strings, and paper towel tubes. Check out the materials list here to see what makes the most sense for your program, and download our educator guide for free below! Have you used Go Fish in your classroom? We love hearing about how excited youth get when they are challenged to help animals—check out the extension an EiE teacher made to this unit, featuring real prosthetic devices and a very cute three-legged dog! And keep your eye on the blog for more “deep dives” into our catalogue of OST units. Interested in summer PD? There’s still time to sign up for our free Back-to-School webinar series: Getting Started With EiE, beginning August 14th.